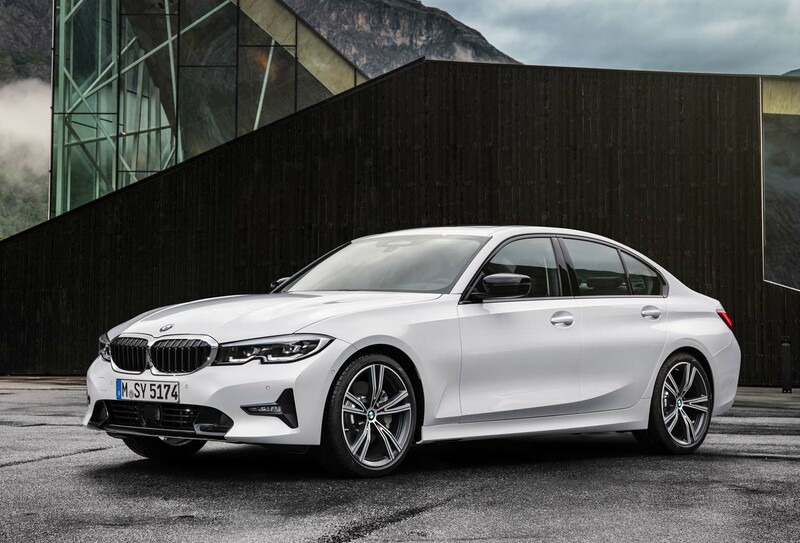 The base-spec version of the new BMW 3 Series must be the best in class to drive if the model is to be hailed a success, declared product manager Stephan Horn ahead of its world debut at the Paris show this week. Dynamic leadership was determined as the key goal for the new car – codenamed G20 and the successor to the F30 model generation – following appraisals taken from customers, media reviews and critical assessment of rivals, which began five years ago. “Our reputation is built on making the best car to drive, and while the current car is good, we knew we could do more and knew our rivals were pushing us hard,” said Horn. Although Horn was reluctant to talk about competitors, two new rival car launches are believed to have prompted BMW’s decision: first, the Jaguar XE, which went on sale in 2015 and was widely regarded to have established a new dynamic benchmark in the class; and the Alfa Romeo Giulia, which was introduced in 2016 and drew praise from enthusiasts for its on-the-limit handling. The 3 Series now sits on the same underpinnings as the 5 Series and 7 Series and is therefore a little bit larger, lighter and safer than the outgoing model. The extra length is almost entirely dictated by enhanced crash regulations and the styling challenges they in turn have thrown up. Significantly, the 3 Series’ axle tracks have widened at both the front and rear, with MacPherson strut suspension used up front and a multi-link arrangement at the rear. Key to the dynamic updates is an innovative new passive damping system that, combined with stiffer springs on the suspension, is said to make the 3 Series sharper to drive but also, when road surfaces deteriorate, allows the car to maintain a flat, composed ride. In addition, the steering set-up has been overhauled. 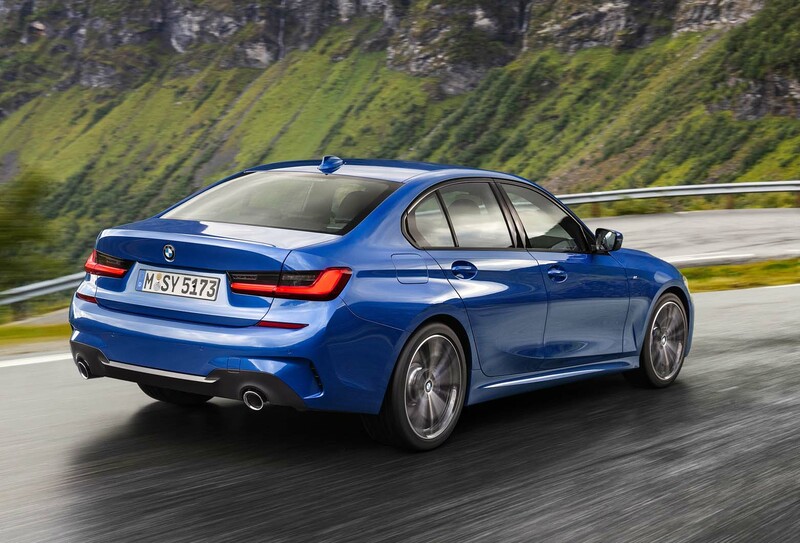 Buyers also have the option of enhancing the 3 Series’ dynamic capabilities by moving up the trim levels from SE or Sport to M Sport, which sits 10mm closer to the ground and features more rigid bearings, additional body struts, firmer springs and anti-roll bars and more wheel camber. 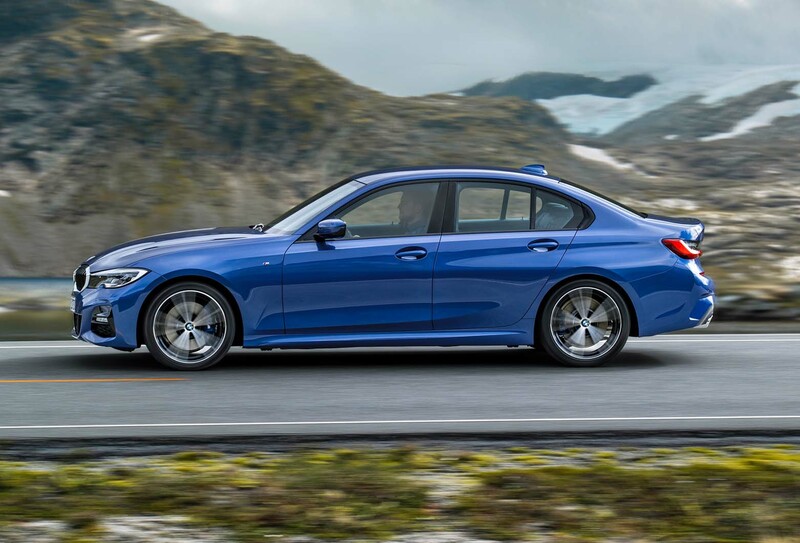 An optional M Sport Plus pack includes a more advanced active adaptive damping system and the option of a limited-slip differential. Horn added that BMW’s engineers have now acknowledged they had overcomplicated previous model line-ups by making the highest level of dynamic performance accessible only to cars fitted with optional active damping. 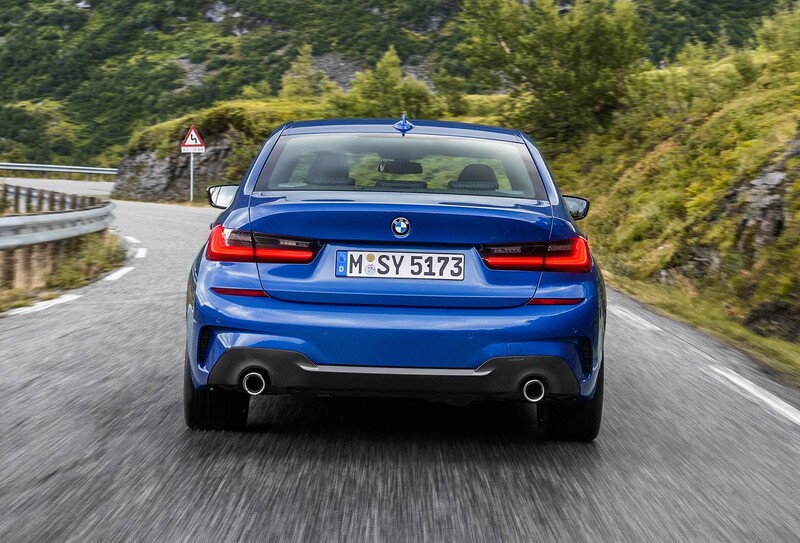 As a result, it is the new 3 Series base car that has been most extensively benchmarked against rivals. When deliveries begin next March, power will come from a choice of two diesels and one petrol. 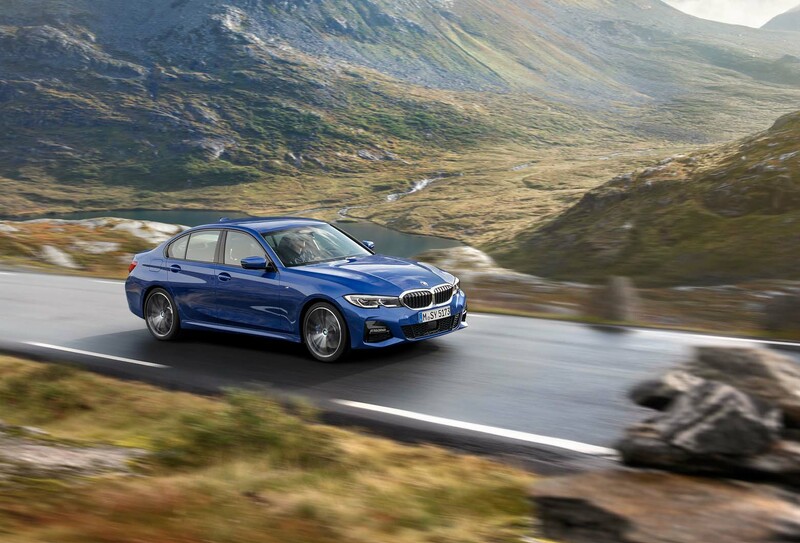 The usually bestselling diesel 320d will be available in standard form and with xDrive four-wheel drive. It will make 161bhp and 295lb ft of torque, in line with the outgoing Efficient Dynamics model of today but less than the 187bhp of the standard 320d. The 0-62mph time is 6.8sec, fuel economy with the eight-speed automatic is rated at 64.2mpg and CO2 emissions are 115g/km. Four-wheel drive adds 0.1sec to the 0-62mph time and lowers fuel economy to 58.9mpg. There won’t be an Efficient Dynamics model, with Horn saying that it was deemed appropriate to only offer the more efficient engine. However, complications from the requirement to test every variant as part of the more stringent WLTP fuel tests are also likely to have played a part in the decision. 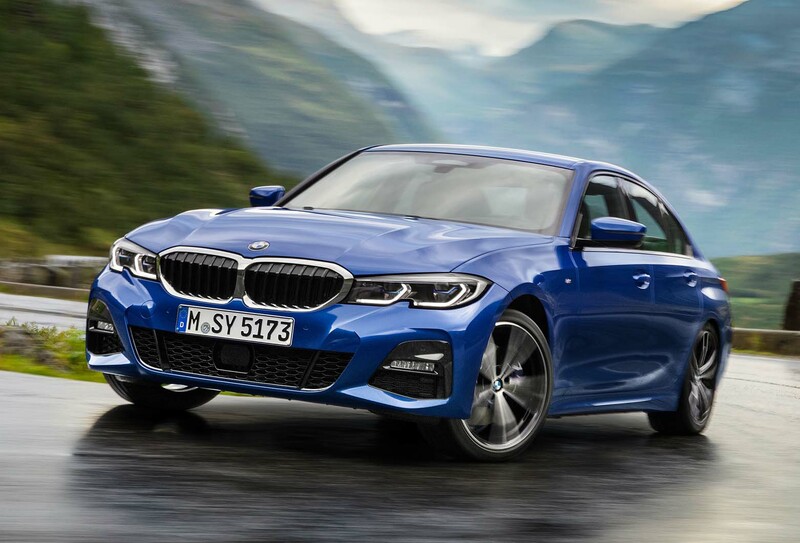 The 254bhp four-cylinder petrol 330i will also be offered in the UK and is expected to gain in popularity if current anti-diesel trends continue. It delivers 295lb ft of torque, accelerating from zero to 62mph in 5.8sec and recording 46.3mpg and 132g/km of CO2 with the automatic gearbox. Fuel economy and emissions are boosted by a significant step in the 3 Series’ aerodynamic profile. Within 12 months of launch, a plug-in hybrid variant, called the 330e iPerformance and offering around 35 miles of electric- only range and 39g/km of CO2 output, will be available. A provisional 0-62mph time of 6.0sec has been suggested. Beyond dynamic ability, two other key areas identified as ripe for change from the current 3 Series were improving the look and feel of the interior and isolating the interior further from wind and road noise by the addition of significantly more insulating materials in the bulkhead and A-pillars and by installing a double-glazed windscreen as standard. Furthermore, more optional flourishes, such as horizontal seat stitching, are available and buyers can also opt to switch the analogue speed and rev dials on the dashboard for a digital display, which can be toggled to show the sat-nav’s map and instructions, as pioneered by Audi. 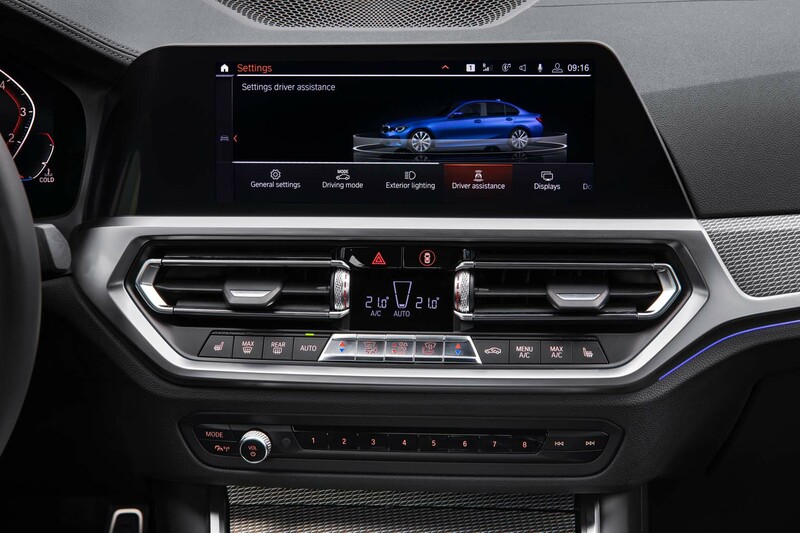 The infotainment screen is 8.8in as standard – the same size as the largest screen on the outgoing car – and can be upgraded to a 10.25in unit as already available on the new BMW X5. 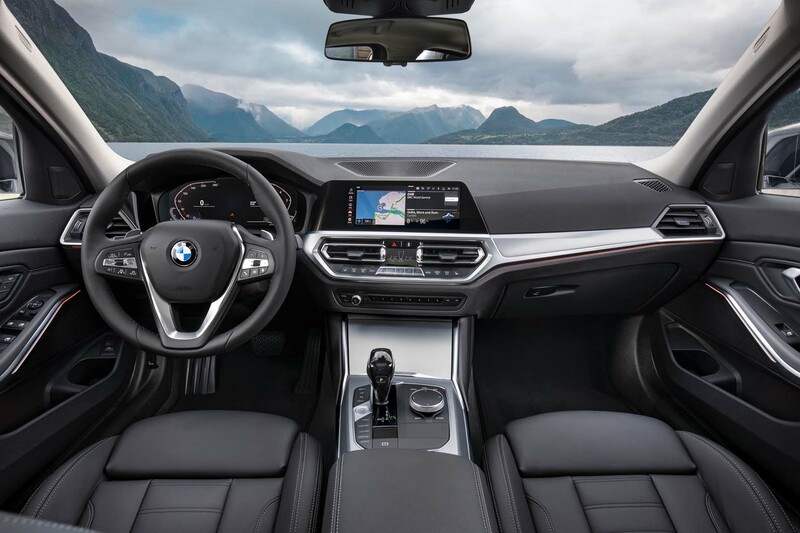 It is controlled via BMW’s latest iDrive system, which has been warmly received for retaining intuitive one-touch buttons as well as allowing access to functions via a rotating controller and on-screen options. For the first time on a BMW, the car’s software can also be updated remotely so that features can be added or upgraded. The small increase in exterior dimensions doesn’t translate into much more space inside the car, BMW reasoning that if you needed more, you would buy a 5 Series. As a result, apart from a fraction more width, the interior is the same size, with the same ratio of space front and rear. Practicality and usability have been improved, though, with the rear seats now split 40/20/40 as standard, more storage cubbies being available, a same-sized but better-shaped boot and the option of up to five USB ports, for instance. A variety of driver assistance functions are available as standard now, including systems to steer, accelerate and brake the car on motorways and in traffic, and to detect potential impacts with pedestrians or bicycles. The most eye-catching technology is a new, unique function, most useful for getting out of parking spaces and available as standard, that records the last 50 metres you drove and that can automatically reverse the route for you. The car is also significantly better equipped as standard than the outgoing car, with kit including a reversing camera, puddle lights, LED headlights, three-zone air conditioning and folding door mirrors. 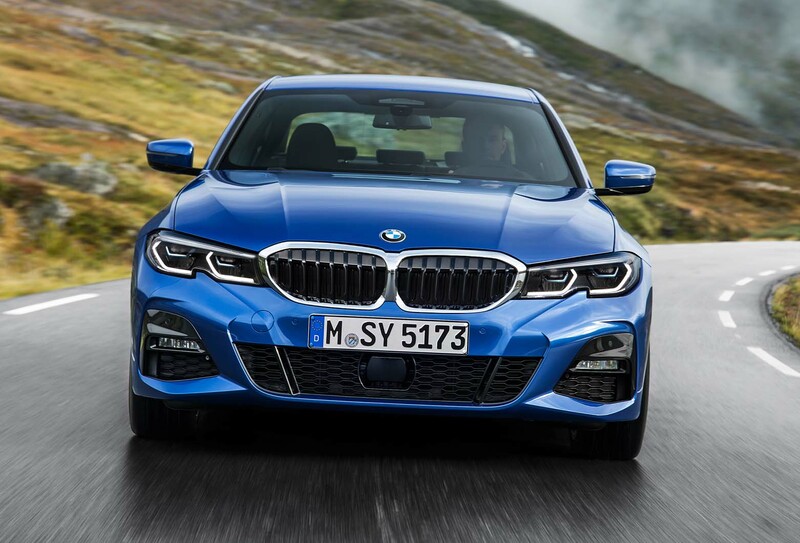 To boost residual values and make choosing options easier, BMW will sell the 3 Series with a range of five pack options that bundle together items with a similar purpose, ranging from the sporty M Sport Plus option to Comfort, Premium Technology and Visibility offers. There are just nine individual options that buyers can specify. Prices will start from £33,610, which, BMW says, is in line with the prices for the current car once the cost of the additional, now-standard options have been taken into account. However, with the marketplace more hotly contested than ever, it is likely that discounts will also be available once the initial rush of interest in the car has subsided. As car firms race to meet demands for SUVs and electrification, it’s easy to forget the importance of a good old-fashioned saloon. The new 3 Series is a reminder that you shouldn’t. Since it was launched in 1975, the 3 Series has been BMW’s bedrock, its perennial bestseller that both underpins and supports its expansion into other areas. Naturally, then, with this latest generation, BMW hasn’t sought to dramatically reinvent the 3 Series: why should it, when the old one still sells in big numbers? Even if the 3 Series isn’t a radical design departure, one thing is clear about BMW’s recent cars: whether it’s the 3 Series, 8 Series or Z4, BMW has shown a clear commitment to producing proper driver’s cars, dynamic motors with all-round ability. Why? Because with the rise of SUVs, it’s not enough just to produce a saloon any more: it has to be a saloon that’s demonstrably better than ever. If BMW does that, the3 Series will remain its bedrock for years to come. A chance to drive a prototype of the new BMW 3 Series in 330i M Sport guise a few months ago revealed much promise, if no certain conclusions. The suspicion is that, in this configuration, an Alfa Romeo Giulia probably remains a more compact and lighter-feeling, marginally more incisive and naturally agile saloon. But then, modern BMWs are relatively complicated, more specification-sensitive cars than most of their executive rivals and I wouldn’t be at all surprised to find that, in just the right mechanical trim, this car could dive and swivel left and right just as keenly as its Italian challenger. Only certain drive modes were available to try on the test drive and this passively suspended 330i M Sport on 19in rims could have been forgiven for struggling a bit in Comfort mode. But the new 3 Series rideswith a surprisingly settled suppleness and dexterity for something of an explicitly sporting brief. It does feel a little bit firm at low speeds and slightly busy over smaller ruts and bumps taken at speed. But it has suspension that’s seemingly capable of working hard within the wheel housings without ruining the level poise of the body until it really needs to. Plenty of Tarmac imperfections are therefore heard but not really felt too much from the driver’s seat – and despite the progressive settings of both spring and damper, the car’s ride frequency feels honest and predictable as the bumps get bigger. The suspension’s outright ability to absorb punishment without running out of travel, meanwhile, is quite remarkable – up there with a really well-sorted hot hatchback. After a switch to Sport+ mode (the only other available to test), the 330i’s steering got meatier and a touch more precise just off centre, without risking the over-assisted pace of the Giulia’s rack or even the initial directness of the XE’s. The reason, of course, is that BMW is focused on catering for the customer who wants to relax a little at 200km/h (124mph) on the autobahn. Do you always start to develop a new car five years before it is launched? “On other technologies, the point is that much of it you don’t have to use but that it can be useful. “The remote heating function is a great example. In many climates, you might not want to pull your phone out to pre-heat the car when you are in your home. Fine – you don’t have to use it. It's bigger, faster, smoother, more complicated... and inevitably more expensive and faster depreciating. I can see this is better for BMW as a more efficient money making machine, but is it what we buyers really want? Like it or not, the BMW 3-series has become the Ford Cortina of our time, the default choice three-box saloon. Maybe we should just be grateful and celebrate the excellence of the average car? Or just wait a bit and buy a used one in a couple of years. The 3 Series is so common, and has been for 20 years now, it's become nondescript and no longer fits the bill as a special, premium car that people aspire to. It's simply an appliance that does a job. And as it's become so common, it no longer oozes quality, class or looks special and desirable, like the 3 Series used to in the 1980s and early 1990s. A time when BMWs (as well as Mercedes) were right up there with Jaguar for prestige and premiumness. Looks like someone is trying to copy Chris Bangle's designs. Look at the side swipes - lifted right off the original Z4. Thing about Bangle's designs is every line met with another and swept through the whole car. He really was a design genuis and few appreciated just how good his designs were. As I said to a friend when we were sitting in demonstrators at a motorsport event recently they're all very nicely put together. The cabin is a brilliant place to be. They hide all the cheap parts very effectively. So in the end you have the legendary BMW unreliability. Based on your injectors failing? Never had any issues with any I owned. Your sob story doesn't apply to everyone else. JD Power - BMW 24th & least reliable. No, based up on the JS Power survey. I've got a friend who's a consistent BMW buyer. I couldn't count how many he's bought. When you ask if it's reliable he'll say they are. But his Z3 had to have the ABS fixed. Z4's alloy wheels kept corroding. Sensor issues too. The X3 had to have the tailgate replaced because of rust (3.5 years old) and other parts resprayed. And all the injectors replaced too. There was other incidents that he had to get fixed too - just forgive my memory on them please! They weren't my cars. Sure this is not a 5 series? So dull and boring to look at....again! What a surprise with the looks, not! And yet again Jaguar will be laughing at yet another poor styling effort from BMW. It's just a smaller version of the 5 Series which in turn is just a smaller 7 Series while all 3 cars are just a mild evolution of their predecessors. Either way this new 3 Series is so dull and boring. It lacks excitement, class, desirability and prestige which the XE, Giulia, Volvo S60 and Lexus IS exude. As for the interior, it's the same story but worse! BMW have used the same styling theme now their interiors for around 20 years and they all look so similar you'd be hard press to not only know which BMW you're in, but which generation too. And it all looks so dull and boring and cheap, while it'll probably be lagging miles behind the XE when it comes to interior quality. And as the XE is so far ahead of the current 3 Series, the gap will still be too big for the new model so it's unlikely the new 3 Series will come even close to the Jaguar, or even the Alfa.